Place your finger on the map at Lancaster and then move it across to the East until you find a large dark patch. This remote and roughly triangular terrain, in and around the Forest of Bowland, is not some black hole where civilisation vanishes but a place where businesses blossom and communities thrive. These remote 53 parishes contradict the supposedly inevitable economic migration towards ever-more-complex city conurbations. In this rural patch you can find a world-leading example of sustainable digital infrastructure – largely because, in the rough-hewn ways across Lancashire/Yorkshire borderlands, the locals would have no truck with BT’s ‘phone-line broadband’. If you live, learn and work in a remote area you soon learn a thing or three about resilience. Here you value the interdependencies on which communities build sustainability. For technologists and economists (and most politicians) there are huge design lessons here. One might imagine (given the popular substitutes for five minutes thought) that densely populated cities would most readily justify the investment in future-proofed fibre. It might be assumed that remote areas would be the least likely candidates for great infrastructure investment. In the UK (and particularly East of Lancaster) almost the exact opposite prevails. Larger places may be woefully underserved by dependence on a supposedly cheap short-term fix but, in this scattering of villages and hamlets, that same dismal design would deliver an even worse performance. Not for them the inadequacies of variable and unreliable phone-line broadband. Digital technologies are a great enabler of economic well-being – but only if they work in all weathers all of the time. That is why the B4RN fully future-proofed design is not just a great example for those who live learn and work away from large towns or cities. It also tells urban city dwellers that they too could aspire to something vastly better, more affordable and more energy-efficient. Local governments are slowly beginning to realise that, whereas BT saw their copper network as a great asset, it is the holes and poles that are of greatest value in this digital era. It is unfortunate that most of those holes and poles are cluttered with copper cables but Local Authorities who have the good fortune (Like Bristol) to own alternative ducts are enabled to speed ahead. This, of course, is not a problem East of Lancaster. There are precious few ducts and many of the poles are rotting relics of a bygone era. So the locals ignore any old holes and poles and, with a great deal of local community cooperation, dig their own ducts into their own fields and blow their own fibres through them. And what they get is 1000Mb/s in both directions. But no one should pretend that this community-led effort is easy. It requires massive motivation and collaboration (particularly from landowners) and astute management of the entire cooperative scheme. Some would say that the broadband service itself is only a small part of the benefit: making it happen demands that communities come together and develop greater cohesion. At the outset in 2011 it seemed like a pipe dream and potential funding was unlikely. Five years on B4RN has shown that it makes perfect sense and, as the Chinese proverb says, ‘Those who say it cannot be done should not interrupt those who are doing it’. Local Authorities everywhere are thinking (perhaps for the first time) that the holes and poles should be far better maintained and unclogged to make way for the future. Down in Westminster, BEIS and the IPA (HMT/Cabinet Office) understand the need for business investor confidence, particularly during the UK’s structural separation from the EU. 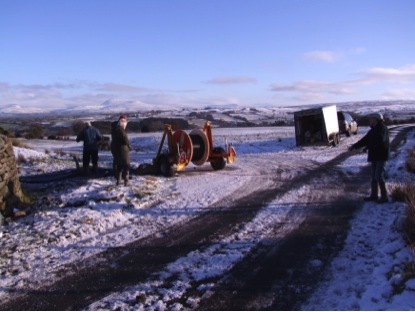 The most immediate trigger for inward multi-sector investment to the UK would be to signal support for well-designed, resilient and sustainable pure fibre networks and replacement of legacy copper. 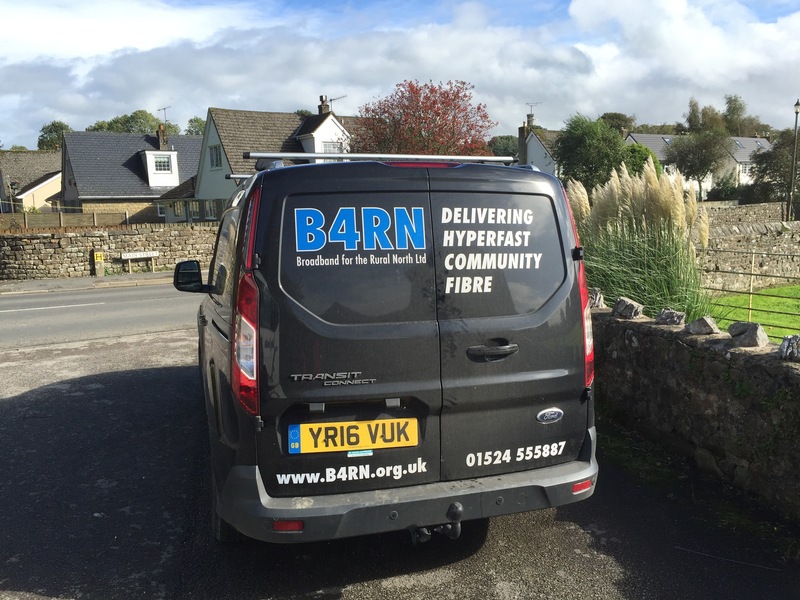 B4RN, East of Lancaster around the Forest of Bowland, may, on a draughty day, seem a very long way from Westminster but strategic connectivity lessons travel at the speed of light – in both directions. B4RN – ‘Blowing toward Thrushgill’ by B4RN shareholder Walter Willcox.